5 possible solutions to reduce plastic in our Oceans. For more than 50 years, global production and consumption of plastics have continued to rise. An estimated 299 million tons of plastics were produced in 2013 and 348 million tons in 2017, confirming a significant upward trend over the past years. People tend to forget that plastic takes in average 450 years to biodegrade in the nature, and if we compare the path and speed of plastic component used each year to the speed it actually vanishes, it is more likely in 2050 to be drowning under our consumption of plastic before it would actually biodegrade. 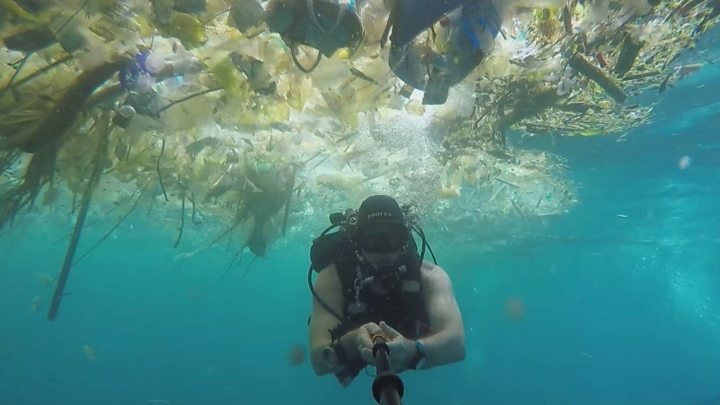 Diver Rich Horner has captured video of himself swimming through water densely strewn with plastic waste and yellowing food wrappers, with the occasional tropical fish darting around. The researchers calculated that an estimated 8 million tons are entering the ocean each year. As a result there are five massive patches of plastic in the oceans around the world. 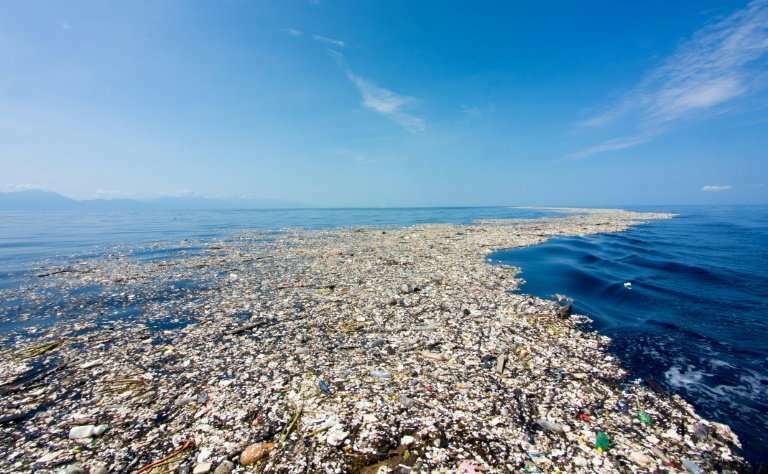 These huge concentrations of plastic debris cover large swaths of the ocean. The one between California and Hawaii is the size of the state of Texas. It seems essential to note that if we keep consuming plastic at this rate, by 2050 there will be more plastic in the oceans in weight than fish. As another and less visible collateral effect, the plastic when it biodegrades do not dissolve but instead get into smaller pieces called microplastic. The precise extend of Microplastic is still unknown at this stage while a recent study led by Greenpeace East Asia measured that 90% of table sea salt shown signs of Microplastics. Eight million tonnes of plastics enter the oceans every year, much of which has accumulated in five giant garbage patches around the planet. In terms of plastic regulation laws have been regulating very slowly the production, the last advancements within the EU reached an agreement last year on a single use plastic ban including plastic cotton swabs, cutlery, plates, straws, drink stirrers and sticks for balloons. Costa Rica is taking dramatic action against plastic waste with plan to ban all single-use plastics by 2021. This includes straws, bottles, cutlery, cups and bags. San Pedro La Laguna law 111-2016 became effective in January. It prohibits plastic bags and straws, Styrofoam containers and all packaging materials made of polystyrene. 1. To forbid the production of products or devices made a 100% out of virgin plastic. Alternatively a tax on virgin plastics should be applied. 2. A specific department in each country should review and authorize the mass production of plastic devices (We still amazed to see plastic bananas carrying a banana…). 3- Instigate that all devices made of plastic materials shall be recyclable, which is far from being the case at this stage, and a huge amount of plastic produced each day is actually non recyclable. These non recyclable plastic materials shall be in the short term forbidden. 4- To invest in initiatives or lower taxes for companies who produce alternatives to plastic and being 100% recyclable in order to increase their competitivity towards plastic products. 5-To obligate the plastic producers to redistribute a fixed percentage of their profit to plastic collection NGO’S and awareness initiatives around the world, that incentivise local populations to collect plastic and raise awareness on the devastating effects of wild garbage dumping. Efforts from all different parties (Consumers, industries and Governments) are needed to actively fight against further increase of plastic production. In order to preserve our environment and biodiversity which is considerably threatened by our current irresponsible and unsustainable consumption and production. We all seen the images of plastic destroying our various resources hence it seems that it is about time to deliver solutions equal to the the challenge that we and our future generations are facing. Hundreds of Dolphins carcasses are currently ending on France beaches.